A fantastic day out yesterday at Duxford. ‘A fantastic day out yesterday at Duxford. Our heartfelt thanks go to Keith Perkins and his team from Aero Legends for making our day an unforgettable, and in many cases, emotional experience.’ The day kicked off with a stunning display from TD314 piloted by Air Marshall Cliff Spink, a man who I can only describe as a superb pilot and an absolute gentleman. 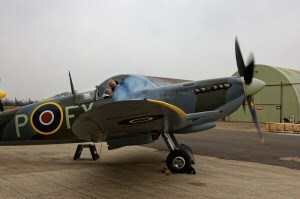 We then got to get up close and personal with the Mk IX Spitfire TD314 where Mick Westlake was the lucky man selected to start the mighty Merlin (well done Sir) and also everyone got the chance to experience the other side by getting into Yellow 10, the Hispano Buchon. This was then followed up with unprecedented access to area 51, the ARCo hangar, the place seldom seen by mere mortals. The place place where the magic happens and our iconic aircraft are brought back to life. Lastly it fills me with pride to see you, the real force in SBNT. The people who make our group what it is with mile wide smiles and knowing that you are taking home memories that will stay with you all forever. Ady The comments made by Ady Shaw head of the group of enthusiasts regarding the Sit in a Spitfire and ME109 day that we arranged for them in conjunction with the Aircraft Restoration Company at Duxford. 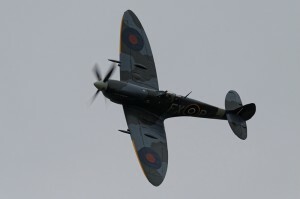 As Ady states, the day started with a stunning display by our Spitfire HFIXe TD314 flown by Cliff Spink. Cliff started flying warbirds during 1991 when as Station Commander of R.A.F. Coningsby he flew the Spitfires and Hurricanes of BBMF. 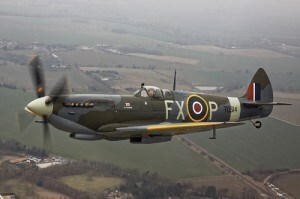 He has gone on to fly Spitfire mark II, V, IX, XI, XIV, XVI and XIX amongst many other types of piston and jet warbirds. After TD had landed one lucky enthusiast, Mike Westlake was picked to start TD314 for a quick ground run under Cliff’s supervision. 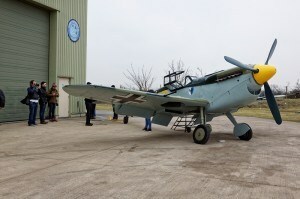 Throughout a packed day more than 50 people sat in TD314 and the Aircraft Restoration Company ME109 Buchon G-AWHK. The Buchon is well known to airshow goers as Yellow 10 painted in Battle of Britain movie colours. Everyone also had a tour of the Aircraft Restoration Company hangar which contains several Spitfires in various stages of restoration including our own T9 NH341 as well as other types of historic aircraft. 4 We would like to thanks everyone involved in making this day happen especially the Aircraft Restoration Company and their staff, the IWM and Ady Shaw, head of the group of enthusiasts.